Raiders of the Lost Scent: SMELL FESTIVAL 2016 : Magiae Naturalis. 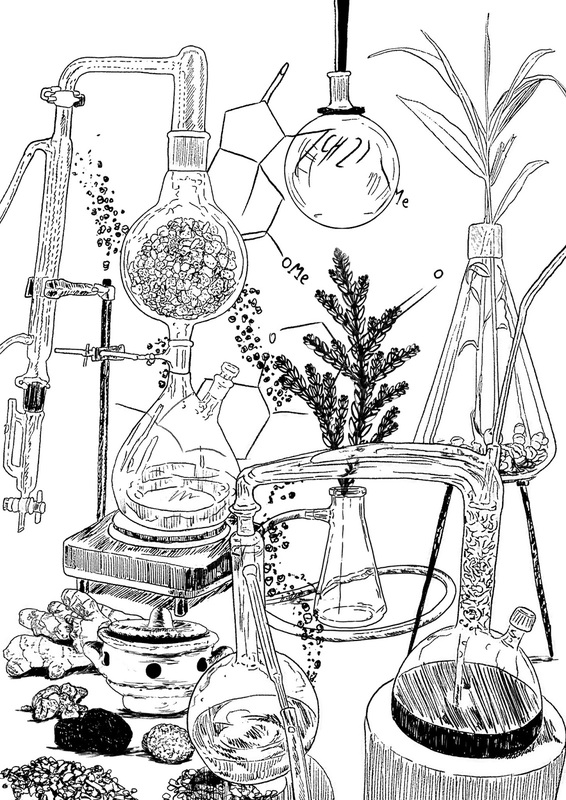 SMELL FESTIVAL 2016 : Magiae Naturalis. Illustrazione © Georges Bousquet - Casajordi. The perfume of Smell Festival 2016 is “Magiae Naturalis”. From May 18 to 22, 2016, Bologna once again welcomes “Smell – Festival dell'Olfatto”, the event dedicated to the sense of smell and the art of perfume. “Magiae Naturalis” has been chosen as the theme for the VII edition. With international guests, exhibits and paths dedicated to botanical perfumery, the Festival celebrates the “Perfumer-Magician” and Nature, the inevitable reference point for any fragrance lover. Bologna, 01 March 2016_ Magiae Naturalis is the theme of the seventh edition of Smell - Festival dell’Olfatto, the event dedicated to the culture of the sense of smell and art of perfume scheduled from May 18 to 22 in Bologna. Promoted by the Orablu association, the Festival avails on the collaboration of the Istituzione Bologna Musei (Institute of Museums in Bologna). 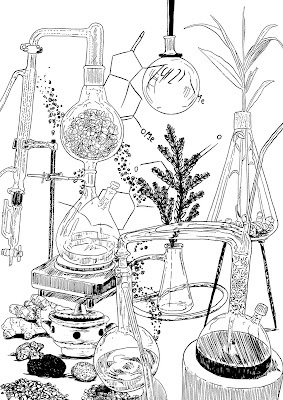 The title of the seventh edition refers to the book with the same name by Giovanni Battista Della Porta: the humanist, scientist and alchemist from Naples, who contributed to spreading the techniques of distillation and the art of perfume at the end of the Renaissance period. The “Natural Magic” evoked by the Festival focuses on the perfumer-magician, who knows the secrets of nature and is part of the transmutation of reality, combining elements through the knowledge of their “magical embraces”. The main location for the event is the Museo Internazionale e Biblioteca della Musica di Bologna, where Saturday and Sunday, May 21 and 22, the botanical perfumery by Olfattiva will be the focal point, transforming the exhibition space of the Museum into a Mediterranean garden. Among natural grass carpets and flowering oranges; spagyric cucurbits and alembics, the Olfattiva space will be an oasis where the public can enjoy sensorial experiences and laboratories dedicated to natural perfumery. From its very first edition, Smell Festival has forged a fruitful bond with the artistic perfume scene, thanks to participation of Italian and international representatives. These include Oliver Valverde, founder of Oliver & Co, the Madrid-based independent fragrance brand with fragrances inspired by numerous influences: from botanical illustrations to outer space. Natural olfactory archetypes are processed by Valverde with an avant-garde approach. Futuring Nature is the title of the presentation at the Music Museum, during which he will share his creative process mindset and his vision of perfumery in the 21st century. Known as a self-made fragrance designer, Oliver Valverde will also hold a perfume workshop where he will introduce the participants to his personal method of composition, based on extemporaneous intuition, abstraction and objective-free experimentation. The botany of outer space is the title of the exhibit he created especially for Smell Festival, using tables, images and olfactory evidence in order to translate the atmosphere of a cosmic nebula photograph into a fragrance. Again at the Music Museum, Alessandro Brun and Riccardo Tedeschi, founders of Masque Milano, contribute to the development of the theme, “Magiae Naturalis”, explaining to the public how a perfume can interpret the smell and symbolism of the Narcissus, a flower rich in mythological and literary echoes around which Romanza – Victorian Narcissus, the latest fragrance by their House, revolves. The exquisite essence of Narcissus Poeticus, cultivated in France and processed at Laboratoire Monique Remy (leader in natural raw materials) is used to compose this perfume that, as is the intent of the two creative directors of Maque, becomes the glorious emblem of the Victorian Epoque, exulting, in pure dandy style, artifice as a creative antidote to the repetitiveness of Nature. As Oscar Wilde said, “A really well-made buttonhole is the only link between Art and Nature." Do not miss the appointment with Room 1015, the French brand founded by Michael Partouche (alias Dr Mike). The brand name refers to the room at the Hyatt Hotel in Los Angeles used to bear the distinction of being favorited by bands like The Rolling Stones or The Who specialists of the “room trashing”. It is known for being the most destroyed room in the story of rock’n’ roll. Escaping from a rigid destiny as a pharmacist, Dr Mike discovered the power of salvation of the electric guitar and, crossing the notes of a Gibson with those of scented materials, he creates powerful perfumed potions. His high volume scented visions will be presented on May 21 at the Museo internazionale e biblioteca della musica in Bologna. During this event, their designer, Dr Mike, will spread rock chills embracing his electric guitar. Given the topic of the event, reference to gardens, locations of delight and sensorial gratification, is a must. 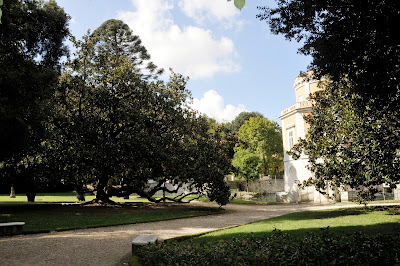 Creating this important connection is a laboratory dedicated to the perfumes and odors of the park and the garden of the Royal Palace of Caserta, held by Addolorata Ines Peduto and Gerardo Pasquale Iodice. The sensorial path winds through the Bosco Vecchio (Old Woods), an area of the park that dates to the sixteenth century, and the English Garden, built in 1786 for Maria Carolina, Queen of Naples and Sicily. Over the years, the Park, 120 hectares, and the English Garden, 23 hectares, have become an enormously important botanical complex for the existing indigenous species and the exotic species, some of which are truly living monuments. 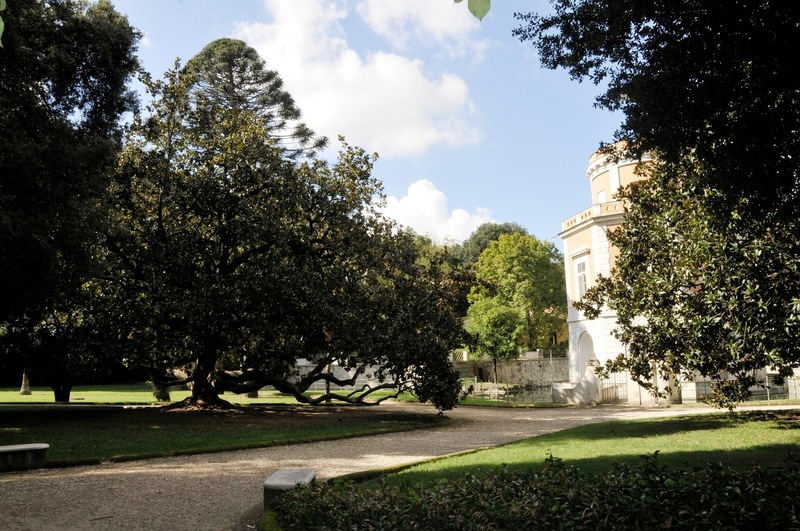 At Music Museum in Bologna, the public can get to know part of this patrimony through botanical samples, such as leaves, flowers, fruits, cones, branches and bark, anticipating the special visit to the Royal Palace of Caserta that Smell Festival is organizing for the summer. The sense of smell is often considered the most instinctive and “animal” of all our senses, another special guest at Smell Festival, Roland Salesse, researcher in the Neurobiology of Olfaction Unit at the INRA (Institut National de la Recherche Agronomique), will reflect on the cultural and aesthetic value of the perception of smells, starting from considerations regarding the nature and physiology of the sense of smell. For decades, Salesse has been working with the sense of smell, ranging from its biology through to very recent applications of this sensorial spectrum within the artistic and theatre environment, as explored his paper “Le spectateur olfactif” (in L'Art olfactif contemporain Ed. C. Jaquet, Les Classiques Garnier, Paris, 2015). Starting on May 18, the days prior to the Smell Festival weekend involve other locations, like the Grand Hotel Majestic “già Baglioni”, Bologna’s 5-star luxury hotel. 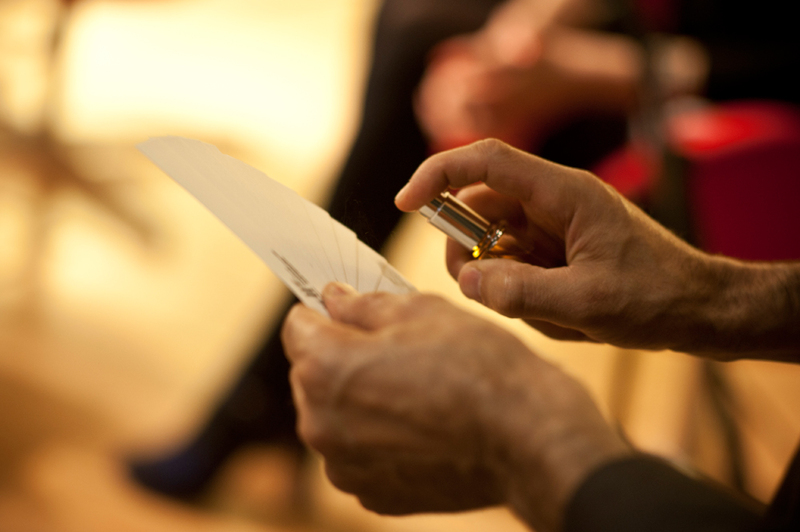 Here, on Friday, May 20, Perfume Showcase will be held: an evening dedicated to a selection of prestigious brands of niche perfumery, with special attention to new formats and products. During the event, Essenses Creative Lab will present “Beyond Appearances”, an interactive game that involves the public in theme paths centered on the leading fragrances of this Italian distribution house: Stephane Humbert Lucas, the acclaimed French Nose; Arty Fragrance by Elisabeth de Feydeau with her products inspired by the Palace of Versailles; Le Galion, founded in 1930 by Prince Murat; Jovoy, the brand bound to the celebrated Parisian perfumery and its ambassador, François Hénin; Olfactive Studio which arose from the meeting between fragrance creators and photographers; Altaia, new project by the founders of Eau d’Italie which encloses the scraps of a story set in Argentina. And, there’s more: Aedes de Venustas, symbol of high perfumery quality and luxury; Eight & Bob, the legendary fragrance loved by Bob Kennedy; the New York brand, Nomenclature, inspired by the beauty of the chemical molecules that have marked the history of contemporary perfumery. Among the brand new products presented at the Perfume Show will be the artisan fragrances by Ac’M Design, emerging from the creativity of Emanuela Mangili Cozzi Mazzucchelli, designer of furniture accessories, jewelry, and fashion accessories, who has captured the olfactory notes for the perfumes of the souls of the locations in her heart. It is a limited edition, embellished with jewels and custom details, like hand turned plugs by Florentine masters. The students of Smell Atelier who have completed the course “Il Linguaggio del Profumo” creating a collection of five fragrances, titled “Magiae Naturalis”, will exhibit their creations. Smell Atelier, as a creative production laboratory, will be involved in creating the fragrances for the performance “Tra Gli Alberi e i Profumi”, by and with Angelica Zanardi, presented the evening of Thursday, May 19, at the Fienile Fluò, an enchanted location among the gullies and nature in the hills of Bologna. The perfumes created for this occasion by Giuseppe Caruso will be the emotional counterpoint of the narration: a free wandering through history, legends and botany, among memories and sensations, shaded by century-old trees. Because Magic is nothing more than the “contemplation of nature”, as Giovanni Battista Della Porta wrote. A Smell Festival 2016 il profumo è “Magiae Naturalis”. Bologna, 01 marzo 2016. Magiae Naturalis è il tema della 7a edizione di Smell - Festival dell’Olfatto, la rassegna dedicata alla cultura dell'olfatto e all'arte del profumo in programma dal 18 al 22 maggio a Bologna. Promosso dall'associazione Orablu, il Festival si avvale della collaborazione di Istituzione Bologna Musei. Sede principale della rassegna il Museo internazionale e biblioteca della musica di Bologna, dove sabato 21 e domenica 22 maggio, sarà protagonista la profumeria botanica di Olfattiva, che trasformerà lo spazio-mostre del Museo in un giardino mediterraneo. Tra tappeti d'erba e aranci in fiore, cucurbite spagiriche e alambicchi, quella di Olfattiva sarà un'oasi in cui il pubblico potrà svolgere esperienze sensoriali e laboratori dedicati alla profumeria naturale. Fin dalla sua prima edizione Smell Festival ha stretto un legame particolarmente fecondo con il settore della profumeria artistica e selettiva su cui la rassegna anche quest'anno si focalizza grazie agli interventi di rappresentanti italiani e internazionali. Tra questi, Oliver Valverde fondatore del marchio di fragranze indipendente Oliver & Co con base a Madrid i cui profumi si nutrono di diverse ispirazioni: dall'illustrazione botanica fino allo spazio cosmico. Gli archetipi olfattivi naturali sono rivisitati da Valverde in chiave avanguardista. Futuring Nature è il titolo della sua presentazione al Museo della musica, durante la quale condividerà con il pubblico la sua visione della profumeria nel 21esimo secolo. Noto per essere un autodidatta, Valverde condurrà anche un workshop di profumeria dove i partecipanti verranno in contatto con il suo metodo di composizione basato sull'intuizione estemporanea, sull'astrazione e sulla sperimentazione libera da finalità. Sarà inoltre artefice di una installazione appositamente creata per Smell Festival, che mostrerà attraverso tavole, immagini e reperti olfattivi, il percorso inventivo attraverso cui ha tradotto l'immagine di una nebulosa cosmica in un profumo. Sempre al Museo della musica, contribuiranno a sviluppare il tema “Magiae Naturalis” Alessandro Brun e Riccardo Tedeschi fondatori di Masque Milano che spiegheranno al pubblico come un profumo può interpretare l'essenza odorosa e simbolica del Narciso, fiore ricco di echi mitologici e letterari attorno a cui ruota Romanza - Victorian Narcissus, l'ultima fragranza della Casa. L'essenza pregiata di Narcissus Poeticus, coltivato in Francia e lavorato nei Laboratoire Monique Remy (leader per le materie prime naturali) è stata utilizzata per comporre questo profumo che, nell'intento dei due direttori creativi di Masque, diviene emblema della gloriosa epoca vittoriana ed esaltazione, in puro stile dandy, dell'artificio come antidoto creativo alla ripetitività della natura. Perché come diceva Oscar Wilde, “Un bel fiore all'occhiello è l'unica cosa che collega l'arte alla natura." Imperdibile anche l'appuntamento con Room 1015 marchio francese fondato da Michael Partouche (in arte Dr Mike). Il nome del brand si rifà alla stanza dello Hyatt Hotel di Los Angeles preferita da band come i Rolling Stones e The Who, nota per essere la più distrutta nella storia del rock’n’roll. In fuga da un disciplinato destino di farmacista, Dr Mike scopre il potere salvifico della chitarra elettrica e da qui, incrociando le note di una Gibson con quelle delle sostanze odorose, realizza le sue potenti pozioni profumate: visioni ad alto volume che il 21 maggio saranno presentate al Museo della musica di Bologna nel corso di un evento che vedrà il loro ideatore, Dr Mike, imbracciare la chitarra elettrica per seminare brividi rock. In relazione al tema della rassegna non poteva mancare un riferimento al giardino, luogo di delizie e appagamento sensoriale. A creare questo importante collegamento, sarà un laboratorio dedicato all'universo odoroso del Parco e del Giardino della Reggia di Caserta condotto da Addolorata Ines Peduto e Gerardo Pasquale Iodice domenica 22 maggio. Il percorso sensoriale si snoda nel Bosco Vecchio, un'area del Parco risalente all'epoca cinquecentesca, e nel Giardino Inglese realizzato nel 1786 per desiderio di Maria Carolina, Regina di Napoli. Nel corso del tempo, il Parco con i suoi 120 ettari e il Giardino Inglese, esteso su 23 ettari, sono diventati un complesso di enorme importanza botanica per le specie autoctone esistenti e le specie esotiche, alcune delle quali sono oggi dei veri e propri monumenti viventi. Al Museo della musica di Bologna il pubblico avrà l'occasione di conoscere parte di questo patrimonio attraverso campioni botanici come foglie, fiori, frutti, coni, rametti, cortecce pregustando la visita speciale alla Reggia di Caserta che Smell Festival organizzerà nel corso dell'estate. Se l'olfatto è spesso considerato il più istintivo e “animale” dei nostri sensi, un altro ospite speciale di Smell Festival, Salesse Roland, ricercatore presso l'Unità di Neurobiologia dell'Olfatto dell'INRA (Institut National de la Recherche Agronomique), farà riflettere sulla valenza culturale ed estetica della percezione degli odori partendo da considerazioni relative alla natura e fisiologia dell'olfatto. Salesse si occupa da decenni di sensorialità olfattiva spaziando dalla biologia fino alle più recenti applicazioni di questa sfera sensoriale in ambito artistico e teatrale, oggetto anche del suo saggio "Le spectateur olfactif” (in L'Art olfactif contemporain Ed. C. Jaquet, Les Classiques Garnier, Paris, 2015). A partire dal 18 maggio, nei giorni precedenti il weekend, Smell Festival coinvolge altre sedi come il Grand Hotel Majestic "già" Baglioni, 5 stelle lusso di Bologna. È qui che venerdì 20 maggio si svolge il Perfume Showcase, serata dedicata a una selezione di prestigiosi marchi di profumeria, con un'attenzione particolare verso nuovi format e proposte. 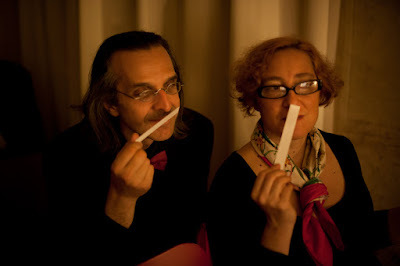 Durante l'evento, nella “sala Vignola” dell'Hotel, Essenses Creative Lab presenta “Beyond Appearances” un gioco interattivo che coinvolgerà il pubblico in percorsi tematici incentrati sulle fragranze fiore all'occhiello di questa casa di distribuzione italiana: Stephane Humbert Lucas acclamato naso francese; Arty Fragrance di Elisabeth de Feydeau con i suoi prodotti ispirati alla Reggia di Versailles; Le Galion, casa fondata nel 1930 dal principe Murat; Jovoy, marchio legato alla celebre profumeria parigina e al suo ambasciatore, François Hénin; Olfactive Studio nato dall'incontro tra fotografi e creatori di fragranze; Altaia, nuovo progetto dei fondatori di Eau d’Italie che racchiude i frammenti di una storia ambientata in Argentina. E, ancora, Aedes de Venustas simbolo della qualità e del lusso dell’alta profumeria; Eight & Bob la mitica fragranza artigianale amata da Bob Kennedy; il brand newyorkese Nomenclature ispirato alla bellezza delle molecole chimiche che hanno fatto la storia della profumeria contemporanea. Tra le novità assolute presentate al Perfume Showcase, ci saranno anche le fragranze artigianali di Ac’M Design nate dalla creatività di Emanuela Mangili Cozzi Mazzucchelli, designer di complementi di arredo, gioielli e accessori moda, che ha catturato con le note olfattive dei profumi l’anima dei luoghi che porta nel cuore. Una collezione dalla piccola tiratura, impreziosita da gioielli e dettagli personalizzabili come i tappi lignei torniti a mano da maestranze fiorentine. Espongono inoltre le loro creazioni gli allievi di Smell Atelier che hanno concluso il percorso didattico dedicato a "Il Linguaggio del Profumo" realizzando una collezione dimostrativa di cinque fragranze intitolata “Magiae Naturalis”. Smell Atelier, come laboratorio di produzione creativa, sarà infine coinvolto nella realizzazione delle fragranze per lo spettacolo teatrale "Tra gli alberi e i profumi", di e con Angelica Zanardi, presentato la sera di giovedì 19 maggio presso il Fienile Fluò, luogo incantato tra i calanchi e la natura dei colli bolognesi. I profumi realizzati per l'occasione da Giuseppe Caruso faranno da contrappunto emotivo alla narrazione: un libero girovagare tra storia, leggenda e botanica, tra ricordi e sensazioni, all'ombra di alberi secolari. Perché la Magia altro non è, come scrisse lo stesso Giovanni Battista Della Porta, se non “contemplazione della natura”.